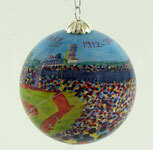 Celebrate 100 years of Boston's Fenway Park, home of the Boston Red Sox, with this limited edition ornament. The oldest active ballpark in the country, Fenway was built in 1912. 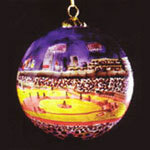 The ornament is a unique design by Marsha York. Hand painted from the inside. Marsha is a New England native who started painting in oil over twenty years ago wtih Robert Scott Jackson. Marsha's work is meticulously reproduced here on the inside of this glass using small brushes and hours of craftsmanship. Each piece is individually hand blown and hand painted. 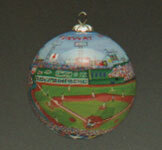 Size of ornament is 3" diameter. 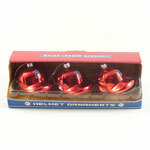 Each ornament comes with a padded colorful gift box with locking lid.